Today’s game was made by Soleau Software, originally released back in 1993. The company was mostly one person, William Soleau, who was a prolific producer of shareware for MS-DOS machines during the early 1990’s, and is still developing new games today. 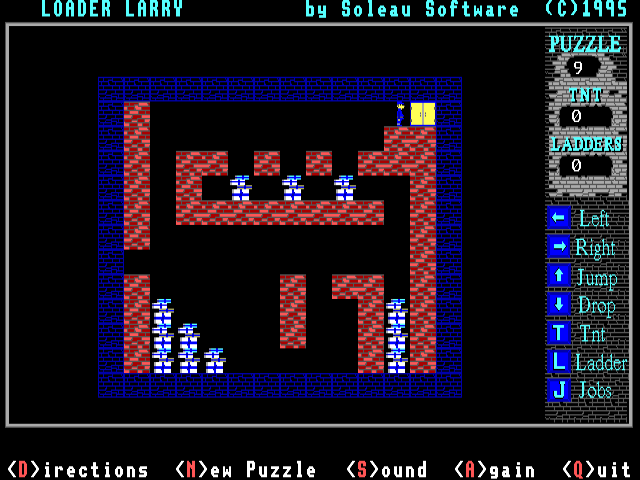 Loader Larry can be considered a more advanced version of Block man as it has more game mechanics, although the puzzles aren’t necessarily harder. Interestingly both games came out in the same year, I haven’t seen anything to confirm this, but I assume Block man came first as it is the simpler one. I also noted that Taking Care of Business is very similar as well, which makes me wonder if these games are a clone of something older that I can’t think of or find. Graphically Larry uses pretty much the same technology that all MS-DOS Soleau Software games did, EGA graphics at 640×350 resolution. This has unfortunately squished my screen shots a bit vertically, so I’ve had to scale them to appear as they would on screen. Artistically it’s a little better than Block man with better detail in the tiles, but both are comparable given they use the same technology. PC speaker sound is present but fairly basic. The controls are pretty much the same as those found in Block man, the movement however has been slightly improved. You can now turn around without moving a tile, and can pick up blocks that are under another. This makes it easier to move around in general, but care still needs to be taken so you don’t get trapped. 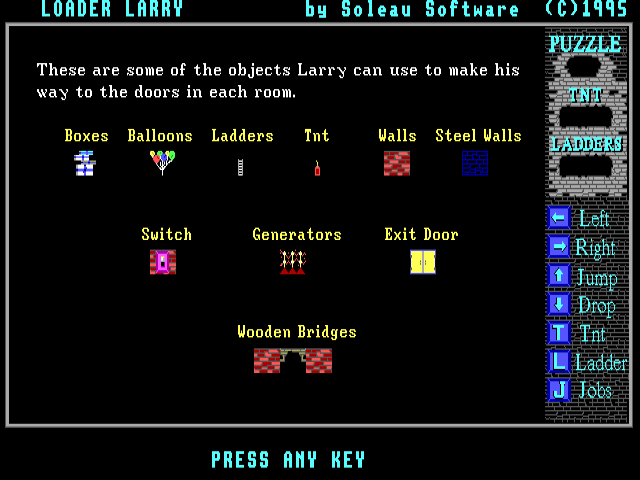 I found Loader Larry to be a challenging and charming despite its technical simplicity. It’s just the right amount of game to fill a gap where you need a bit of entertainment and challenge without being so big you have to invest loads of time. That being said you might not find it re-playable once you solve all the puzzles. Soleau Software is still around, so if you have nostalgia for these games you can still get them at their website, where they still offer registration for the MS-DOS games for $8 US.